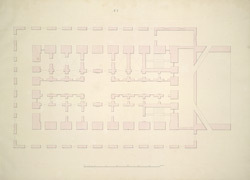 Pen-and-ink and water-colour drawing of a 'Ground Plan of the Buildings for Public Purposes' at Government House, Chennai (formerly known as Madras) by John Goldingham (1767-1844) in 1803. This is one of 16 drawings of plans, elevations, and sections of Government House and its adjoining buildings made under the supervision of John Goldingham, Civil Engineer, Madras. 1803. These drawings were copies made for Lord Clive Governor of Madras, 1798-1803 (later 1st Earl of Powis).